The ninth edition of the conference “Development of the Polish railway infrastructure” was held on 17-18 November 2016 at the Headquarters of PKP Polskie Linie Kolejowe SA in Warsaw. The event was attended by nearly eighty companies and one hundred and sixty participants. During this two-day meeting, representatives of the most important institutions and enterprises dealing with rail infrastructure presented plans related to the maintenance and modernization of rail networks, as well as discussion on cooperation between the infrastructure manager and entities carrying out investments. The guests were greeted by the president of PKP Polskie Linie Kolejowe Ireneusz Merchel and the director of the Polish Chamber of Equipment Manufacturers and Services for the Railway Adam Musiał. Before the commencement of the substantive part of the conference, the House welcomed with joy and pride a new member company – a construction company COVER, successfully carrying out even the most difficult tasks in the field of industrial construction, hydropower, sewage management and protection and repair of building structures. The conference was held under the patronage of the Parliamentary Infrastructure Committee, the Ministry of Infrastructure and Construction, PKP Polskie Linie Kolejowe SA, the Office of Rail Transport and the Railway Institute. 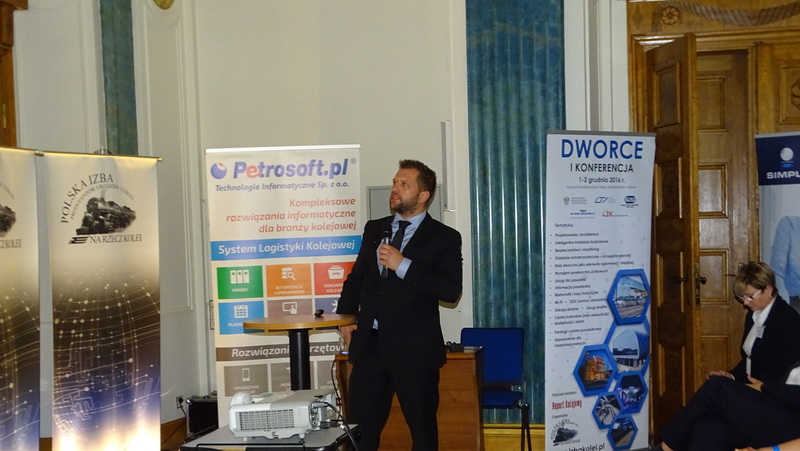 The silver partner of the conference was COVER Radosław Grunwald, and the brown companies: Petrosoft.pl, WYG International and Edbak. The conference was discussed, among others on the acquisition and efficient use of EU funds. According to Mr. Bittel, in order to effectively modernize the rolling stock and infrastructure, a real and EU-compliant strategy is needed that maximizes the benefits of the support provided to rail. The rail transport itself is one of the most efficient and ecological transport systems in the area of both passenger and freight transport. Małgorzata Zielińska, Deputy Director of the Department of Infrastructure Programs in the Ministry of Development, emphasized the importance of the Strategy for Responsible Development, in which railway transport, including increasing its availability and improving the conditions of service provision, is one of the key assumptions. The lecture of the president of PKP Polish Railway Lines Ireneusz Merchel enjoyed great interest. In his speech Merchel discussed issues related to the updating, implementation and importance of the National Railway Program. The purpose of the investments carried out by PKP PLK is to create a coherent network at the end of the 2014-2020 perspective, including: improving the attractiveness of rail freight transport and passenger transport in agglomerations and inter-commercial traffic. After the speech of President Merchel, the speaker was a silver partner of the conference, Radosław Grunwald from the company COVER, who talked about the modern technology of stabilizing the railroad ballast. The technology offered by COVER allows to significantly improve the strength parameters of compacted crushed stone. Thanks to its application, it is possible to minimize the maintenance costs of the track system and tamping of the ballast. The glued conglomerate allows the introduction of a high-speed rolling stock, which is an important step in the future of the Polish railways. New technologies and solutions for railway infrastructure WW conference talks were held as part of three thematic panels. In the first panel, the subject of digitalisation of the Polish railway was discussed, in the second – speakers discussed such issues as: modern and functional equipment of passenger service facilities, role and function of systems supporting project management in PKP PLK, durability and legibility of railway markings and the role of the Center of Timetables in structures PKP Polskie Linie Kolejowe. The third and last panel discussed the implementation of modern technologies that improve railway safety.